Here are additional materials and activities I have created for teaching Deutsche Welle’s Top-Thema module entitled “Europa wird alt“. The original Deutsche Welle materials can be accessed from the theme webpage, or the text and exercises (pdf) and audio (mp3) can be downloaded for offline use. After they have read the text and the accompanying Deutsche Welle activities have been exhausted, we work with the text in new ways. Students work with vocabulary from the text, referencing the article as necessary for context, to find the German synonym or definition that fits best. On Day 2 of working with the text, students work with vocabulary again. This time, they use flashcards containing vocabulary words. Sitting in groups of 4 (ideally), pairs of students take turns trying to describe the word on their card to the other pair, but without using the word or any root contained within the word. For example, if the word is Geburtenrate, students are prohibited from using the words Geburt and Rate. The words can be copied onto slips of paper or index cards. Or you can print my set of cards using two pieces of paper or cardstock — or print multiple sets if you have a lot of students. Use a different color paper for each set so it’s easy to keep them separated. If you want to turn it into a game, have students keep track of which pair or which student correctly guesses the most words. DOWNLOAD Weitere Fragen zum Text. But not only Kindergeld. Also Elterngeld in the first 12 to 14 months to replace lost income so that a parent can stay home with the infant, Elternzeit which allows a parent to stay home until the child’s 3rd birthday and not be terminated from a job, and Betreuungsgeld for children who stay home with a parent instead of going to a day care facility. Students discuss in this context what cultural factors contribute to Germans having fewer children despite financial incentives and what kinds of incentives might be more attractive. Was könnte die Regierung noch tun, damit man mehr Kinder haben will? 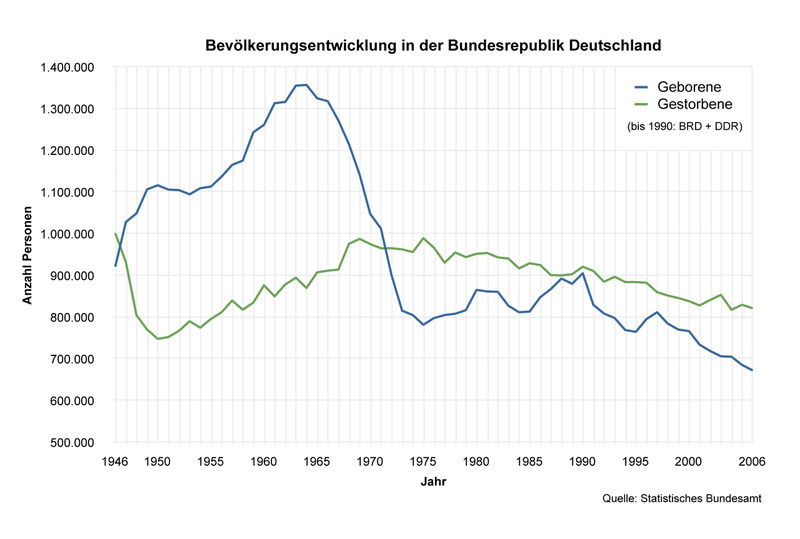 • “Zuwanderung.” Statistics for the period after 2010 show that the German population on the whole rose ever so slightly three years in a row, reversing the multi-year downward trend. And it rose only because increased immigration made up for the low birthrate. • “Länger arbeiten.” Workers who have paid into the social system for 45 years can retire at 63, but the current retirement age for most workers is 65. A norm of 67 is gradually being phased in and there is talk of eventually adding a tier of 69 years for the youngest workers. Read up on current thoughts about pension reform and immigration and check the most the current table of federal child care support to supplement the discussion of the text. Assigning this activity lets me see what’s going on in students’ heads. Many don’t know where a prepositional phrase begins and ends. Some identify adverbs, separable prefixes, and other parts of speech as prepositions. Prepositional phrases often contain the “extra information”, the details of a sentence and students can get bogged down by them when trying to make basic sense of longer sentences. If they learn to bracket off prepositional phrases in their minds, they can more easily break down the language chunks in front of them. But first they have to learn what a prepositional phrase looks like! And the original Deutsche Welle Top-Thema page in HTML, with audio and comprehension exercises, is here:”Europa wird alt“.